Explanation: Bright planets Venus and Jupiter are framed by the National Solar Observatory's McMath-Pierce Solar Telescope in this very astronomical scene. The photo was taken at Kitt Peak National Observatory on March 9. A heliostat sits atop the 100 foot high solar telescope tower to focus the Sun's rays down a long diagonal shaft that reaches underground to the telescope's primary mirror. Of course, after sunset shadows were cast and the structure illuminated by light from the nearly full rising Moon. 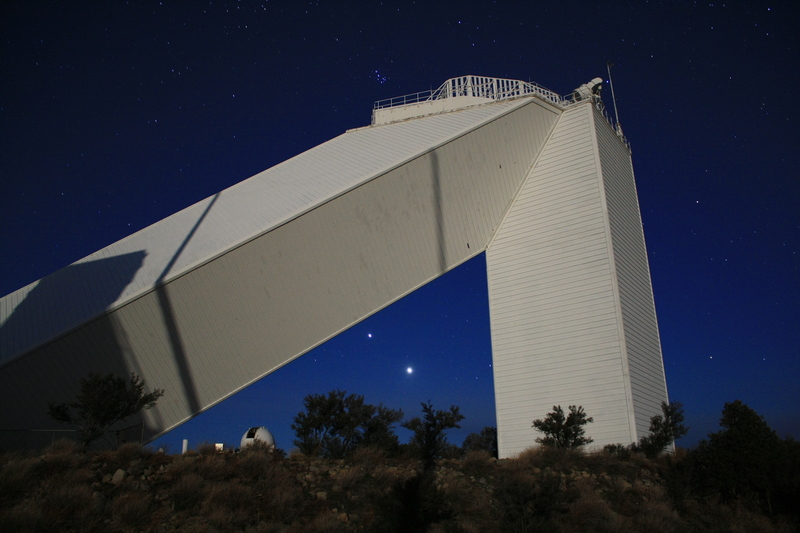 Opened to begin the night's work, the dome housing Kitt Peak's 2.1 meter reflector is included in the frame, while the Pleiades star cluster shines above the heliostat tower. The angular McMath-Pierce was commissioned 50 years ago to study the Sun, but has also made many observations of these two bright planets. On this night it was conducting observations of sodium atoms in the tenuous lunar atmosphere.